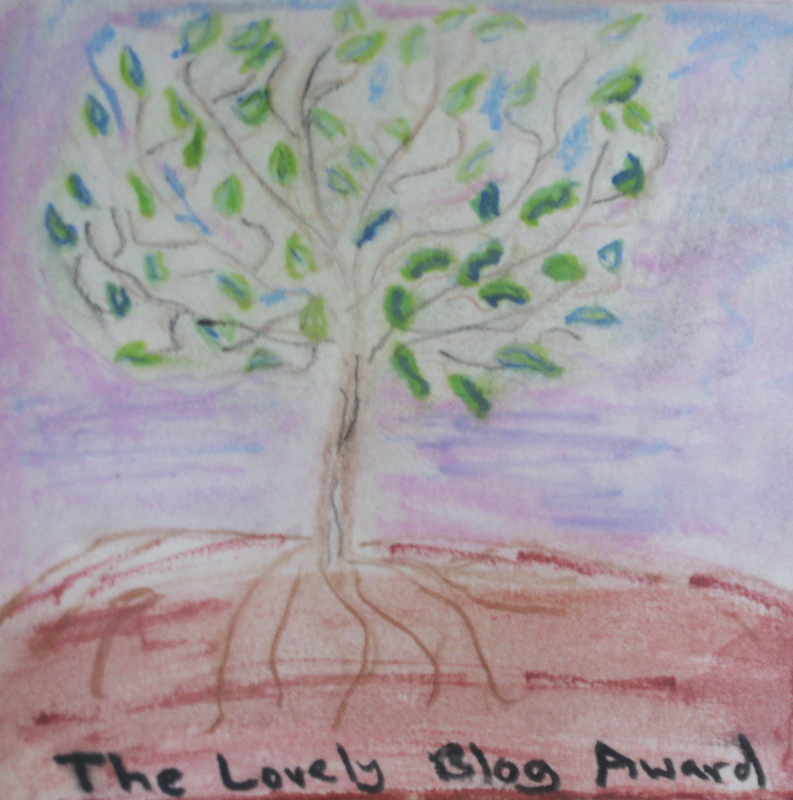 The Lovely Blog Award. 6″ x 6″ watercolor pencil on paper. Sharyn Dimmick. Last week Shira of In Pursuit of More tagged me in a relay, charging me with writing about hope and John Clinock of artratcafe generously bestowed on me the one lovely blog award. I am honored by the kind intentions of my fellow bloggers and will do my best to live up to their trust. A major tenet of the two forms of Buddhism I have practiced is the practice of letting go, letting go of outcomes, letting go of expectations, letting go of desires. This does not immediately sound like fun, does it? That’s because we want what we want, even if wanting it is causing our suffering. I am personally undertaking a course of consciously letting go these days because I find myself falling in love. First I fell in love with a city, a country, a way of life, when I went to France. Then I fell in love with my guitar again, starting to play daily after a hiatus of a year. I fell in love with my room, starting to see ways that it could be improved. Every summer I fall in love with open water swimming when the days get warm enough to swim at the cove down in the Berkeley Marina. And, as you might have expected, I am somewhere on the continuum of falling in love with another person with all of that continuum’s abundant symptoms: sleeplessness, excitement, fear of the unknown. There is pleasure in falling in love and there is pain. There is fantasy and reality, hope and dread. I find that the easiest approach, although it is hard to put into practice, is to treat the entire experience as a practice, to work with whatever it brings to me in any given moment: if I am sleepless, get up and read or write. If I am inspired to write a love song, write a love song. If I am scared, feel the fear. One aspect of treating life as a continuous practice is that there is no room for hope. Hope causes us to leap into the future, into some better world that is different from what we are experiencing right here, right now. When I am right here, I can respond to my fear or excitement as it occurs; when I am jumping into hope, I lose my opportunity in the present moment. My teacher is fond of saying “The love you want is no other place.” And, I, of course, am hoping that she is wrong, that there will be glorious love in a field of flowers some other day. But I know what she means: our only chance is this moment, what we find there now, where we find ourselves now. We can’t count on having another moment, better or worse. What we can count on is that things will change: if I am sleepless for three weeks running, during week four I will fall into a deep sleep when the body needs it. The foods of the changing seasons that I highlight on The Kale Chronicles reveal this in a beautiful way: now there are Gravenstein apples and gypsy peppers, summer squash and tomatoes, cucumbers, green figs, the first grapes, blackberries, melons. Soon eggplants will come in and peaches will begin to fade away until next summer brings the new crop. I stir a couple of spoonfuls of apple crisp into my morning oatmeal and plan another round of zucchini-feta pancakes for lunch, topped with Sun Gold cherry tomatoes. Next month, perhaps next week, I will be eating something different. Food becomes more satisfying when you are not reaching for raspberries in December and tomatoes in February, when you eat what there is now, choosing your favorites, perhaps, but working with what you’ve got. Love cannot resist reaching into the future, imagining scenarios, conjuring kisses out of the air. So let it. Just know that the fantasies, the daydreaming are a current and temporary state: mine them for their images and ideas, laugh at them and at yourself, an ingenue in a fifty-four year-old body. Watch as your mind tosses up Loggins and Messina songs (Where did they come from?). Sing them if you want — no one needs to know. What do I hope for? I hope for the courage to face my life, the courage to be in whatever state I find myself in until that state changes. I hope for the courage to respond authentically to whatever I need to respond to. Today I thank Shira (who is in La Belle France) for encouraging me to meditate on hope and John who says lovely things about The Kale Chronicles. With my one-year blogging anniversary coming up fast (next Sunday) I tell you that I had some hopes for the blog: I hoped a few people would like my recipes. I hoped my writing would acquire a wider platform. I hoped a few people would buy my paintings and maybe even my music CDs. I hoped that I would find some writing students who want to do writing practice. Some of that has happened. But writing The Kale Chronicles has become much bigger than that because I have discovered an entire community of like-minded souls, people who care passionately about what they eat and where it comes from, but, beyond that, care about how they live their lives, treating each other with kindness and humor. I started a blog and found myself in a whole new community. I am made welcome here as I am made welcome in my communities of writers and singers and artists. And I will be calling on you soon with a special anniversary challenge, The Lauren Project — I know you will step up to the plate. There will be prizes and glory and the opportunity to help a lovely young woman find more joy in the kitchen. Cucumber Raita. 6″ x 6″ watercolor pencil on paper. Sharyn Dimmick. In the meantime — back to the present — a simple raita recipe for cucumber season, courtesy of Padma, my Indian roommate in college, who taught me how to make it. The secret to good raita is no shortcuts — you must cut the cucumber into spears and de-seed it with a knife and then you must slice each spear into small bits with the knife — if you grate it, the cucumber turns watery. Raita is all about texture. So set aside an hour to make raita — you won’t be sorry. Peel 2 cucumbers (or use an Armenian cucumber, which requires no peeling). Slice each cucumber lengthwise into quarters, sixths or eighths, depending on its circumference. Remove all of the seeds. Slice the now seedless cucumber into small pieces and put in a steel or Pyrex bowl. Grate 1/2 of a fresh coconut into cucumbers. Add one bunch chopped cilantro. Heat a small amount of peanut oil in a small skillet. When oil shimmers, add 1 tsp of mustard seeds and 1 dry red chile. Fry for a few seconds until mustard seeds pop and add chile, mustard seeds and oil to cucumber mixture to season it. Add plain yogurt and salt to taste, making it as creamy or as light as you like. Food notes: You can, of course, make this with dessicated coconut — it’s just not as good as when you use fresh. Make sure your coconut is unsweetened — sugar in raita is gross. You can eat the raita as a salad, as a side dish with an Indian meal, or simply mixed with rice. 2) I like to eat pie for breakfast, although I usually eat oatmeal or polenta cooked with milk and sweetened with seasonal fruit. 3) My favorite color is kelly green. I also like lavender and blue, crimson, claret, raspberry, all balanced with plenty of black. 4) I am a Pisces, Sagittarius rising, Gemini moon, Venus in Aquarius. 5) Although I am a folk musician and will always be one, I have always (always?) had a fantasy of singing with a rock band. 6) If I could only eat one type of food for the rest of my life, it would be Indian food. 7) This bull needs a big meadow: don’t put me in a pigeonhole — I won’t fit. 1) Celi at The Kitchen’s Garden — Celi writes about sustainable farming, a subject dear to my heart. Beyond that she is fun and knows how to tell a story. 2) Shira at In Pursuit of More has endeared herself to me by her generosity and her commitment to simplicity. 3) The Caerus blog, a brand new blog, showcases the artful thoughts of Suzanne Edminster, Karina Nishi Marcus and a growing cadre of guest artists. Look for it on Thursday mornings and go back to read the back archives. 4) The Literary Jukebox. I found this one this morning. Maria Popova posts a literary quote and a song everyday. Great for literate music junkies. 5) Debra at Breathe Lighter. Debra shares all aspects of her life in San Gabriel — recipes, photographs, pet stories, field trips, music, all accompanied by her enthusiasm for life. 6) John at artratcafe provides an art education by featuring the work of many diverse artists. He writes poems, too. Foodies will like his brilliant posts on food that combine illustrations, literary quotes and recipes with a certain je ne sais quoi. 7) John at From the Bartolini Kitchens writes an ongoing love letter to his Italian family and the foods of his culture. Want to make cheese or fresh pasta? See John. 8) Eva Taylor of Kitchen Inspirations knows how to put it all together: the dress, the shoes, the place settings. Lately she has been experimenting with healthier, lighter versions of favorite foods, keeping to a low-carb diet. 9) Betsy of Bits and Breadcrumbs cooks food I want to eat — I’ve said it before and I’ll say it again. 10) My writing pal Bob Chrisman has branched out and now writes a memoir-type blog called swqm60. Check it out. 11) Jane Robinson at Art Epicurean posts abstract paintings and encouragement for creative types. 12) My old friend Maura writes theonceandfutureemptynest about her life with husband, children, grandchildren, parents, dogs, running shoes, kayaks and literary ambition. A graceful writer, her thoughts will resonate with the sandwich generation. 13) I’ve already sent you to look at Deby Dixon’s photos on Deby Dixon Photography. Have another look, please. 15) Your nominee. Please use the comments to tell us all about the blogs you love the most, the ones you open first everyday, among other things. We have free speech here. On Saturday my friend Margit and I walked through the Berkeley Farmers’ Market. I had been the week before and bought my first Brooks cherries of the year, walnuts in the shell, brown mushrooms. Stone fruit is beginning to come in: I saw apricots and bought a couple of baskets of cherries from Kaki Farms. Strawberries continue strong. Blueberries are here. Some vendors had bins of summer squash and the first beautiful broccoli was beginning to peep its heads out of baskets. But the thing that made me happiest was the bunch of basil I bought for two dollars. Ah, basil. I didn’t even like the stuff when I was a child: it was just another mysterious seasoning in a Spice Island jar, dried and weird. It didn’t remind you of turkey stuffing like sage or pizza like oregano. Fresh basil was not seen or smelt at my house. Making Pesto. 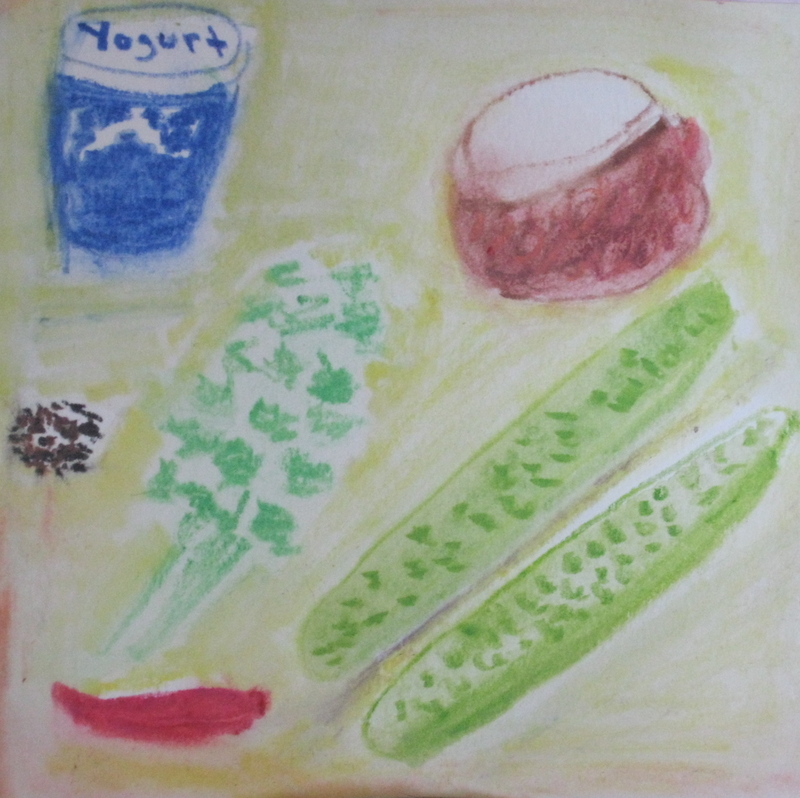 8″ x 8″ Gouache and Watercolor Pencil, Sharyn Dimmick. All that has changed now. All late spring, summer and early fall, I buy basil by the bunch and set it like a bouquet in a glass of water on the kitchen counter next to the olive oil. I chiffonade it over green beans and steam them, tuck it into ears of corn before roasting them, add it to Greek salads, put it in turkey meatloaf or burgers. It is probably the herb I use most during the summer. Today and many other days will find me sitting at the breakfast room table, pounding torn basil leaves, salt, garlic, walnuts and grated cheese in my large Vietnamese mortar with a little olive oil. Did I say walnuts? I did. Classic pesto is made with pine nuts. I have nothing against pine nuts except the cost. If I lived in New Mexico or Italy I might make pesto with pine nuts. Since I live in California I make it with walnuts and have come to love the combination of bitter and sweet freshly cracked nuts with pounded basil leaves and garlic (I also use walnuts to make a cilantro pesto, flavored with lime). The first pesto I tasted was served in a restaurant (I no longer remember which one). When I lived in San Francisco I used to buy little plastic tubs of Armanino pesto. Then for awhile I made my own in a blender, until my friend Leila mentioned that pounded pesto had a superior texture. Because our blender is old and cranky I was spending lots of time mincing basil and garlic before feeding its maw and I decided to get a mortar and pestle. My friend Elaine and I went mortar hunting in Oakland Chinatown and I brought back not one mortar, but two: I have a small marble mortar that I use to crush spices and small amounts of nuts and I have my big wooden Vietnamese mortar for pesto duty each summer. I start in the kitchen, smashing garlic cloves with the side of a knife and peeling the skins away. The garlic goes directly into the mortar and gets a sprinkle of kosher salt, which helps the pestle break down the garlic fibers. 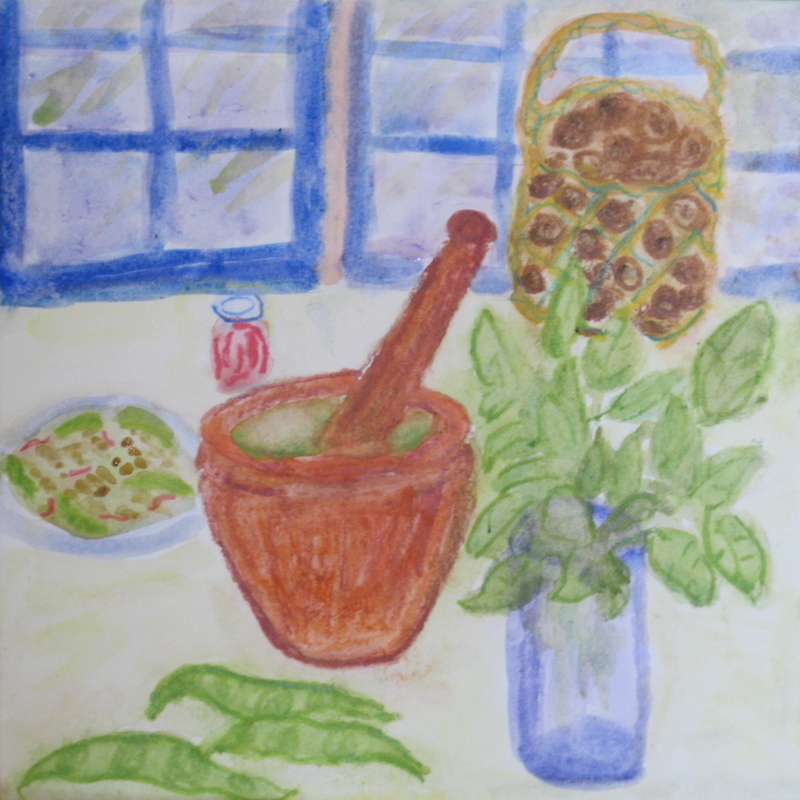 Then I take a utility bowl, my basil bouquet and the big mortar and pestle into the breakfast room. I inhale the spicy green scent of the basil as I pick leaves, discard stems, and tear each leaf into smaller pieces. I pick and tear for awhile, then I pound for awhile, then pick and tear another layer of leaves. The aroma gets richer. When I have torn and pounded every last leaf I take the basket of walnuts and nutcracker from the sideboard and start cracking and shelling. There is no measuring involved: the pesto comes together and is done when its taste and texture suits me — the size of the bunch of basil is the determining factor: I will add enough other ingredients to blend with it, to complement it, but the basil is the star, so I start with garlic and salt, add all the basil, then add walnuts. The last step is grating Parmesan or pecorino with my microplane and stirring in a little olive oil. If I need a break while I am pounding basil I will pour a little olive oil over the top. This helps keep the color bright. I do not care for oily pesto and have a light hand with the oil: I am not too fussy about whether the final product is bright green: I know it will be delicious and we are going to eat every spoonful and scrape the jar besides. I never get tired of pesto. When the basil really gets going in mid-summer I try to make enough of it to freeze to last all year. I am never successful because if I have fresh pesto on hand I want to eat it on pasta, on sandwiches, in salad dressing, on green beans, on broccoli, on broiled portobello mushrooms, dolloped on the top of a pizza just out of the oven, or added to a winter vegetable soup. Every year I manage to freeze a few small jars or a bag of pesto cubes made in an ice cube tray, but I am dipping into my stash practically as soon as basil disappears from the Farmer’s Market. At the same time, I have days when I wonder why I have bought yet another bunch (or two, if they are on sale), condemning myself to a few more hours of sitting at the table, pounding away when I could be walking or swimming or reading or whatever else it is that people do on long summer days, instead of inhaling basil fumes and oil of walnut rising from warm wood. We ate our pesto with whole wheat rotini, fresh sugar snap peas and some roasted red peppers from a jar. Food notes: You can, of course, make pesto with any fresh leafy herb and any nut. Some people use seeds instead — pumpkin seeds, sunflower seeds. Margit is allergic to walnuts and pecans so she can make hers with almonds. Elaine has used Brazil nuts successfully. Pine nuts are delicious. You can make pesto from arugula or from soaked sundried tomatoes. Some people make it with spinach or kale. You can mix herbs, too: basil, cilantro and mint is nice, or arugula and mint. You can make it in a blender or a food processor if you have one. Blogging notes: Susie of SusArtandFood very kindly nominated me for another blogging award, the illuminating blogger award. I love it when people read The Kale Chronicles and I love it when they like it and I really like it when they find something useful here for themselves. What I don’t like is posting blog award patches on my site — I don’t think they look nice. And while I’m happy to let you know what blogs I enjoy reading I am not much good at making lists of them on the spot: I do have lists of links, although I probably should update them — perhaps at my one-year anniversary. You will find more details about me and my life in the posts than you perhaps want so I don’t think you need to know that my favorite color is green or that my favorite ice cream is coffee ice cream. My emphasis is seasonal home-cooked food. I’m quite happy when you read and comment on The Kale Chronicles and I do my best to respond to every comment I receive. Thank you all. When I started a blog called “The Kale Chronicles,” I liked the alliteration and I felt like I was perpetually struggling with kale: Riverdog Farm put in my vegetable box frequently and I had found no truly satisfying way to eat it in three years. Then I went to Mabel Dodge Luhan House in New Mexico this November and Jane Garrett served a kale salad. I ate some. Then I went up for seconds. Then I asked for the recipe. Jane obliged and I have made this salad twice since returning home. Every time I make it, I eat big bowls full of it and I eat it everyday until it is gone. I made it again tonight and just ate a flat soup bowl full of it. Why do I like it so much? It could be the dressing: Meyer lemon juice, olive oil, garlic, tahini, tamari and a little bit of honey — I might eat that on shoe leather, although I doubt it. I might like it because you blanch the kale before attempting to eat it. I just like it. I’ll give you Jane’s version as she wrote it and then I’ll explain how and why I altered it. Blanch two bunches of kale*. Add what you like: grated carrots, radishes, dried cherries, almonds, red potatoes, feta, mint. *If you are going to eat kale, you need to remove the stems and ribs. Jane didn’t tell you this because she thinks everyone knows it. So, before you blanch the kale, remove the stems and ribs and compost them. My alterations: I don’t have any Braggs’, which I believe is Braggs’ amino acid, or some such thing, and I haven’t been inclined to go out and get any. I deduced that it was contributing the salty flavor, so I substituted 1 Tbsp tamari for the 2 Tbsp of Braggs’. I used Meyer lemons because we have them growing in our front yard — they are sweeter and less sharp than Eureka lemons, the ones you usually find in the supermarket. I used 1/4 tsp honey for the agave because, once again, I don’t keep agave in the house — I don’t object to it or its flavor — it’s just not something I have around the house. Lastly, I don’t measure my olive oil: take Jane’s measurement if you want to be precise — I just dress the kale with some olive oil, mix together the other ingredients and toss the salad. I haven’t been adventuresome in mixing things into this yet because I actually like the taste of the kale smothered in this dressing. I did put in half a handful of dried sour cherries tonight, but I couldn’t really taste them — the dressing is pretty powerful. What I hope is that this salad helps some of you eat kale who have found it hard to enjoy in other preparations, especially those of you who are at your wits’ end when kale shows up in your farm box (Someone removed a bunch of kale from his box today and set it on top of the stack for someone else to take home!). It works for me. 1) I love to sing. I sang in school choirs and church choirs. I have one CD, “Paris,” featuring traditional ballads, original songs and covers. 2) I started a ballad-singing group in Berkeley many years ago. It’s still going. 4) I used to work as a Recreation Leader in a program that brought together children with disabilities and able-bodied, neurotypical children. 6) I love open-water swimming and swim in the Berkeley Marina, weather-permitting, from May through October. 7) I sell paintings. Just thought I’d throw that in because I do sell my original watercolors. I am happy to sell them. I am working on developing related products, including cards, trivets, canvas bags, etc. with images from “The Kale Chronicles.” If you want something, please ask. Bitsandbreadcrumbs by Betsy — Betsy cooks stuff I want to cook myself. Kitchen Inspirations by Eva Taylor. Can’t tell you why exactly — that’s the nature of inspiration — I just like Eva’s blog. Angry Cherry — the baking blog with personality and many original ideas. She makes things I want to try someday. JustaSmidgen — lovely photos and some stunning recipes: malted milk meringues anybody? Or pomegranate salad? Lauren is baking her way around the world, making things from every country she can think of. She is particularly honest, which makes her fun to read. Linda, at Savoring Every Bite makes lovely cheesecakes, attends to decor as much as to food, is generous with her comments and posts a variety of recipes. Pumpkin fans must subscribe to her blog in the fall. Bewitching Kitchen. Sally has a not-so-secret love of baking bread. In this, we are sisters. She just posted a wonderful-sounding caramelized carrot soup. SmittenKitchen. This is a big, well-known blog. You may already read it. If you don’t, go there now: Deb has it all: recipes, photos, stories. As you can see, those are food blogs. I also read art blogs, or art and food blogs. And, somewhere in between, I found Dichotomyof. She makes colorful patchwork cushions, raises children and cooks, too. Bees ATC. Nancy posts a drawing everyday around midnight central time. They are usually colored pencil drawings. 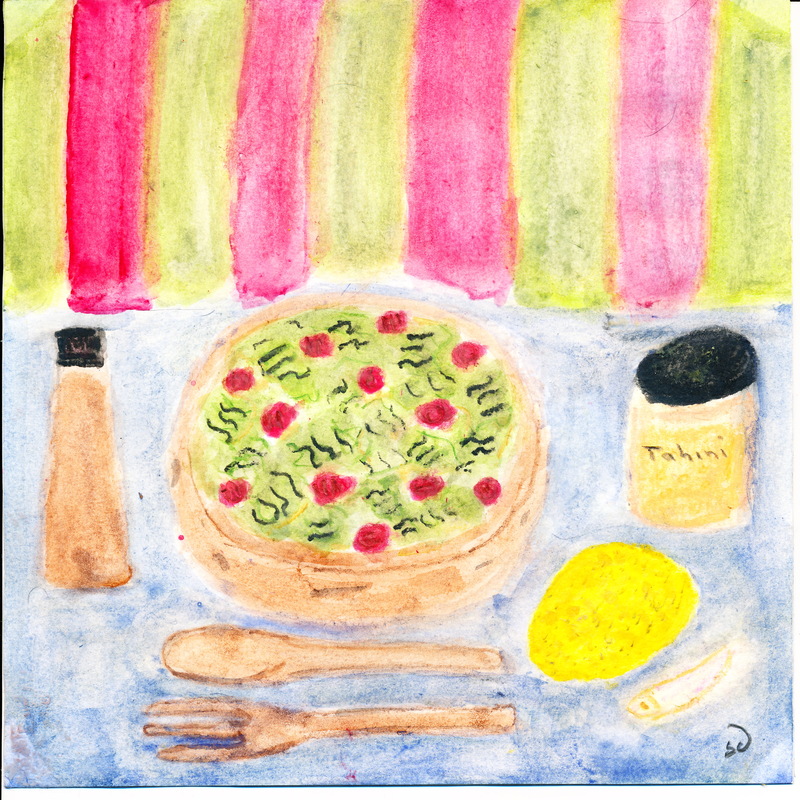 And, last, but not least, there is Donna Louise, neither a food nor art blog, but a modern serial by a funny, offbeat writer who shall remain nameless for the time being (at the writer’s request).